Jesse Castelotte and Tayo Fagbule have written a fascinating report on the Nigerian art market. Led by the work of two artists with global reputations—El Anatsui and Ben Enwonwu—there’s a tension between the works of Nigerian artists being sold around the world (but primarily in London) and the domestic auction market for artists’ work. That domestic market was about equal to the value of the work of Nigerian artists sold abroad in 2013. 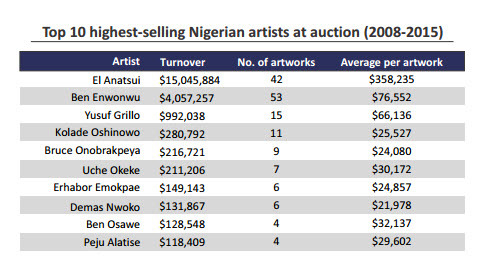 Over the last two years, the domestic Nigerian auction market has declined while the value of those top artists selling abroad has increased. On the positive side, the average price of works by non-Nigerian artists sold in Nigeria has risen steadily and substantially over the past two years. The value of artworks sold at auction in Nigeria declined for the second consecutive year from $1.77m in 2014 to $1.37m in 2015. The drop in sales in 2015 was 18%, three times more than that of 2014. El Anatsui retains his spot as the artist with the highest turnover, after overtaking Ben Enwonwu (b.1917-1994) in 2014 — four works of art by Anatsui generated $229,713 in 2015, double the $152,710 three of his artworks fetched in 2014. 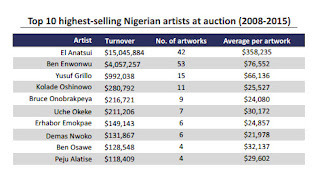 In 2015 the average price of works by non-Nigerian artists at auctions held in Nigeria was 11% more than the average price of works byNigerian artists, despite its 3% increase from the previous year. Sales of artworks by Nigerian artists at Bonhams brought in $1,774,330 in 2015, 23% more than the $1,373,198 generated by artworks by Nigerian and non-Nigerian artists at auctions in Lagos. The rise in Bonhams’ sales was partly due to auction of the art collection of Afren, an oil company with financial problems. Over 108 exhibitions — 69 solo and 38 group shows — were organised in Nigeria in 2015, according to data compiled; 64 of these events held in galleries. One-quarter of the 70 pieces by non-Nigerian artists that have gone under the hammer in Lagos since 2013 are by Ablade Glover. 2. LONDON African Art: Easy Pickings For Chinese Collectors? sophisticated, knowledgeable collectors who purchase for aesthetic pleasure. They are people who look at an El Anatsui [sculpture] and think, ‘That would fit with the rest of my collection’, no matter whether they own any other art from the region. And, as we all know, Chinese collectors are some of the bravest and most ambitious in the world. [William] Kentridge in particular has proved popular with Chinese collectors. Although many artists have been influenced by the profound changes China’s presence in Africa has wrought, Kentridge has gone one step further, creating a series of drawings and installations that explore parallels between the Cultural Revolution and apartheid-era South Africa, both devastating regimes that blindly pursued an unobtainable utopia. These artworks were brought together under one exhibition, titled “Notes Towards a Model Opera”, that opened at the Ullens Centre for Contemporary Art in Beijing last year and Seoul this year.